Robert S. Quigley, who would have been 91 this coming Friday, has finally been reunited with the love of his life, Betsy on Monday, September 17, 2018. He was another member of America’s Greatest Generation who has left us too soon. Bob was a good man who was blessed to live the American Dream as a husband, parent, and 65-year resident of Roanoke. He passed away early Monday after being admitted to Carilion Roanoke Memorial Hospital on Sunday. A resident of Brandon Oaks for the last few years, where he enjoyed the friendship of other residents and the care-givers. 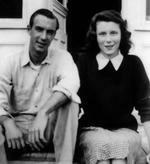 Bob was born to Margaret and Charles Quigley on Wednesday, September 21, 1927 in Mobile, AL. He grew up near Wenonah, NJ and was one of the many young men and women who served our country during WWII. He dropped out and joined the Navy shortly before graduating from high school, serving on an aircraft carrier towards the end of the war. After leaving the navy, he came back and finished high school where he met his future bride, Betsy. He was a wonderful provider for his family as a hardworking traveling sales representative for Hollywood Candy Company and Topps Chewing Gum Company who he represented for close to 40 years. Bazooka Joe and baseball cards before they were cool. He typically was on the road 5 days a week selling gum and sports cards to small wholesalers throughout Virginia and the Carolinas. As he and Betsy drew closer to retirement he began to give back to the community through volunteering at the Kiwanis club. He helped run the weekly bingo games for years and served as a treasurer. Bob and Betsy took some amazing world trips together and he took several by himself after her passing. The one thing you could be certain of was that he took virtually all his meals at the hotels they frequented during their travels. He did not like to experiment at meal time. In addition to his parents he is preceded by his wife of 56 years, Elizabeth G. Quigley, who passed away in 2004; brother, Charles, and a sister, Betty. He is survived by his four children, Bob Quigley, Jr. and wife, Pattie, Mike Quigley, Carol Carroll and husband, Francis, and Jim Quigley and wife, Lolly; grandchildren, Sam, Skylar, Cameron, Lucy, Miers and Eliza. In keeping with Mr. Quigley’s wishes the services will be held privately with his family. In lieu of flowers, please make any memorial contributions to the charity of your choice.